Following Scott Hanselman's, Steve Richards and Bill Gates lead, I have decided to share my office and workspace setup. This isn't meant to be a gloat about the technology I use rather an explanation of the tools that I use in my job. Plumbers and electricians have cool vans full of all their gear and they probably spend more on that than I have on this. My office is around 4 metres square, though one corner is chamfered off. In order to maximise the space available and still create enough room for my staff to work I have a real mixture of furniture. My desk is a curved reception desk I picked up second hand from the gym when they remodelled. It has nice deep drawers on both sides and the 90 degree curving space is an excellent fit for the 4 monitors I work on - 2 x 22" and 2 x 19" wide screens. It also holds current files and data, pens, blank cds, odds and ends and all the cables to connect my mobile phone, camera, video camera and creative zen. On top at each end I store things that I don't need to look at but need to access. In the middle I have a photo frame of my 4 kids and a Lego Bionicle I was given when leaving a client. The second desk is a home built tower that contains room for 2 19 inch CRTs elevated above the desk, plenty of desk space for papers and other odds and ends, a 7.1 surround speaker system and two high shelves. The first stores lots of small odds and ends, batteries, remote controls, spare business cards, aromatherapy burner and oils etc. This desk is lit by 3 12v halogen lamps. The very top shelf is used for storage and also for my Luxman amp that drives the speakers on my system. I used to use this desk as my main desk before buying the big reception desk. Now it is shared by our staff. I have 3 book cases in my office. The larges stores business materials, some client files, software, music and some DVDs - as well as my deodorant collection! Behind my desk I have a bookcase that supports a whiteboard, and holds current reading, technology magazines and my books to be read. Next to it is another bookcase containing Microsoft software, and some other odds and ends. The open door behind my desk allows access into my garage, I have converted this space into 4 distinct areas. Just through the doorway I have created an air conditioned closet by putting an aircon on the wall and draping heavy black plastic around a 3metre by 2 metre space on clothesline wire strung up near the ceiling. This is for my server cabinet. The air con blows down onto the cabinet. The server cabinet has ain air filter / purifier on top of it. This pumps cool clean air in. The back of the cabinet is open allowing the servers to vent their hot air. This is then sucked away by a fan. The fan runs on a timer so it doesn't need to operate at night time when the air is cooler and the servers are working less. There is a dual Xeon 3Ghz server with 4GB ram running SBS2003 that manages our exchange server, internal Share Point sites, user authentication and data management. There is also a AMD dual core box with 3GB RAM running Linux that hosts file shares for the network of non critical applications, games and DVD ISO's. There is also a spare Linux server sitting on the floor as a backup. (IT is a Pentium 1 133mhz with 32 Mb of RAM but still performs well. We use it for DHCP when running LANS. Behind the cabinet there are 2 UPS for backup power supply for each server, 2 network switches - 1 for the gigabit LAN we use for the PCS and servers, and 1 for the 100MHZ network for printer, test bed and spare ports. There is also a Maxtor Backup Drive designed for backing up the SBS server (it can handle volume shadow files and always open files like Exchange). Finally there is a KVM switch, monitor keyboard and mouse for when direct access to the servers is required. In the corner next to this I have built a test bed area where we run up new computers, test computers we are repairing or rebuilding, and store all our computer parts, boxes and so on. The first of the two big cabinets holds all my computer parts hard drives, cd and dvd drives, ram, network and video cards, fans and power cables. The second holds most of my home handyman hardware, nails, soldering equipment, electrical bits and pieces, tools etc. On top of the cabinets and shelving we store the empty boxes everything came in. This makes it easy to return leased equipment in the original boxes, easily locate motherboard parts and manuals etc. Jude has taken over one whole part of this shelving area for her cricket breeding boxes (used to feed the dragons). This area is lit by 3 12v halogen bulbs on wires as well as a compact fluorescent bulb that can be dragged around if needed. Finally I have used stacked storage containers to separate out the gym set, all the push bikes and my workbench and tools. I like Scott keep all cables that I ever get. I have a large collection of almost every possible combination of video and audio cables hanging up. The other 2 main areas we use in the house for working and studying are the schoolroom and the media room. The school room is long (about 10 metres and quite wide - about 5 metres. We have all the fish tanks and reptile tanks at one end. the other end has the school desks for the girls as well as Jude's desk. There are 5 computers here running on the gigabit network, as well as the wireless router (central location in the house). The kids and Jude each have a computer all running on UPS. The media room should only need to run wirelessly, though I have found it is better to have a 100Mhz cabled switch in here as well. This enables the ability to bring additional computers in here if needed as well as better video streaming. I use an ASUS tablet PC running Vista ultimate and Media Centre here to serve all our music and video files to the HiFi. 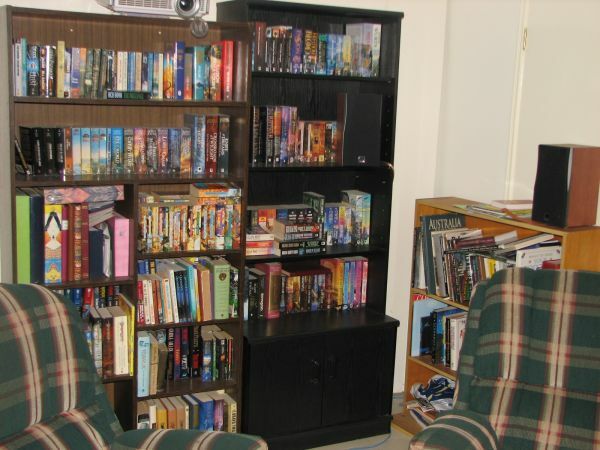 The "entertainment centre" is a bookcase with the back removed from the top 2 sections. In it there is a DVD player, network switch, AV Amp, Digital HD Set Top Box and the Tablet. We use a Logitech Harmony touch Screen Remote to control it all. There are two big bookcases and one smaller one at the rear of the room. The DLP video projector is on top of one of them. There is a 4th small bookcase in front of the equipment cabinet containing DVDs, the original equipment remotes and the mouse and keyboard for the laptop. These rear and side bookcases also hold the rear and side surround speakers. In front we have the two main speakers, the sub woofer and centre speaker, a fan and the projector screen. Two large reclining easy chairs at the back of the room hold Jude and myself while the two 2-seater couches hold the kids, though they often crash on the bean bag on the floor instead. This is a very comfortable room that we have built to enjoy time together as a family watching movies, reading and listening to music and hanging out together. Finally in the lounge/dining area we have a small 19" flat screen TV, a Digital media tuner, DVD/VCR combo and a laptop that we use to stream music to wirelessly. These are connected to Logitech speakers. I build the stand out of bricks left in a housing site dumpster and some timber shelves from an old bookcase. Your house seems to be not very spacious but a lively place to work at. I just enjoy reading about your life and work.Thanks for sharing your experience. Your office is bigger than my room, i think you have a great space there, just you have a lot of stuff too. well that is cool :D thanks for sharing, i really enjoyed your post. keep up the good work! great blog thanks for sharing that info with me i will be using it really soon. Is it 2.1 Logitech speaker set you have there? I highly recommend the 5.1 set, namely Logitech Z-5500 for its digital inputs and great sound quality.